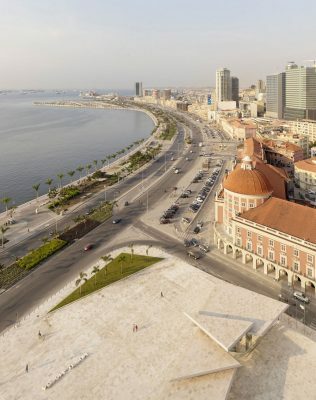 Lisbon, April 2010 – One of the most ambitious projects of Risco architects is the concept design for the future new towers – Sky Residence II + Sky Business – located in Luanda Sky Center. Two towers with great programmatic diversity, aiming for high urban density and encouragement of further developments around this so-called Sky Center, the future new town. Sky Residence II, a tower with 22 floors, create apartments of great comfort to make the most magnificent sea views and the plateau was the main objective of the proposal. To risch this Risco architects combine simplex and duplex types and “breaks” the original volume in to volumes of smaller size, increasing the perimeter and creating bumps on the facades laterais. With this solution apartments natural light and sea views increases 80%. Interior integrates different design solutions from those used in traditional housing. Exterior is marked by horizontal planes of the floors, interspersed with metal brise-soleil that will do the shading of glazing and allow optimum comfort conditions inside. Sky Business seeks to ensure the assumptions own an office building (grand lobby, a system of clear and effective access, etc.) and treats the facade as the central element: a structural facade, which receives the load of the floor slab and allows offices without pillars, increasing its flexibility and its usable area. The external design seeks to establish relations with the neighboring building, through cuttings and alignments, and seeks to create diverse situations in different elevations. Its rectangular modules (in some cases vertical, other horizontal) allows an efficient shading of glazing, subject to natural light, contributing to an excellent efficiency of the building. Both towers are, based on a common two-storey basement.